The drawing displayed in sections at the top of this page is © David Grech. The final tab below contains the whole image. Whaddon Parish Council decided late in 2004 to set up a committee to produce a Parish Plan for the village. Such plans should be redone every five years or so, and so in 2012 proposals were made to repeat the exercise in 2013. The 2013 plan is available on this web site! The aim of the plan is to help the village plan for the future, by obtaining detailed views of those who live in Whaddon. Links to the 2005 plan will be found below. This page presents the background information to the new Plan following information supplied by the present Steering Group. Contact information is in the Steering Committee tab below. If you would prefer to read the information in a PDF file, follow this link. In 2001 the then government devised the concept of parish plans and in 2006 the Whaddon Parish Plan Steering Group circulated a very detailed questionnaire. This enabled us to publish a very comprehensive plan which was well received by most villagers and public bodies to whom it was submitted and thus enabled our Parish Council to prioritise many of the issues that villagers felt needed to be addressed. The Parish Council takes the lead in providing the village with what is wanted and when external help is needed it must seek to convince either South Cambridgeshire District Council, the County Council or other public bodies for resources, all in competition with other communities in the local area. A properly researched village plan is an important tool when dealing with external public bodies. This process is now called a Community led plan and is under the guidance of a Steering Group who, on behalf of the Parish Council, have reviewed the last plan and produced a new questionnaire. It is hoped that this will provide a snapshot of the village as it is in 2013 and reflect how villagers would like to see Whaddon develop in the next 5 years. Community Led Village Plans are designed to last for 5 years and thus a new one is overdue. Our new questionnaire is more concise than before as we don’t want to burden residents with a lot of irrelevant or repetitious questions. Of course, Whaddon is a rural village with a small population and there will inevitably be limitations on what is realistically possible. We have, therefore, also tried to avoid questions that might produce responses which are simply not achievable. Our main objective in producing a new village plan is to allow you, the people who live in Whaddon, to decide how you want the village to develop in the future and to set a range of objectives or targets with priorities where appropriate. Please be assured that this is not just another piece of petty bureaucracy. You will be able to see in the new plan that is produced, that many of the objectives set back in 2006 have been achieved and, for most residents, Whaddon is a better place in which to live. The answers in the Questionnaire will be analysed and will form the basis of the 2013 Whaddon Village Community led Plan. The village plan is important and to put together the best possible product the Steering Group needs your help. We need you to put aside 15 minutes or so to complete the questionnaire as accurately as you can. The more residents in the village that do so, the more we can reflect a village-wide picture of Whaddon and the views that people hold on where we should set our sights. We hope you will help. Whaddon Parish Council decided late in 2004 to set up a committee to produce a Parish Plan for the village. The aim of the plan is to help the village plan for the future, by obtaining detailed views of those who live in Whaddon. Printed copies of the plan have been distributed to every house in Whaddon; copies in PDF format are available here. See the document for credits to those involved. In September 2008, the Parish Council reviewed the plan, and produced this summary of progress. As of Summer 2009, the council is very pleased with the progress that has been made. It has been drawn to our attention that a new plan should be drawn up every five years, so in 2010 we shall be undertaking the procedure again! A consultation draft for a Village Design Statement for Whaddon was distributed to all households in the Parish along with the September 2009 edition of the Whaddon News. This Village Design Statement has been prepared on behalf of the Parish Council by a group of Whaddon residents and is intended to identify how the village has developed to date and to provide guidance for new developments to ensure the character of the village survives into the future. The final version of The Village Design Statement was formally adopted by the Parish Council on 8 February 2010. This version, complete with its appendices, is available to download in PDF format (3.9 mb). The Parish Council is deeply indebted to those who took part in the group which prepared this document: David Grech, Claire Sime, Phil Neale, Chris Coningsby and Sandra Stephenson. 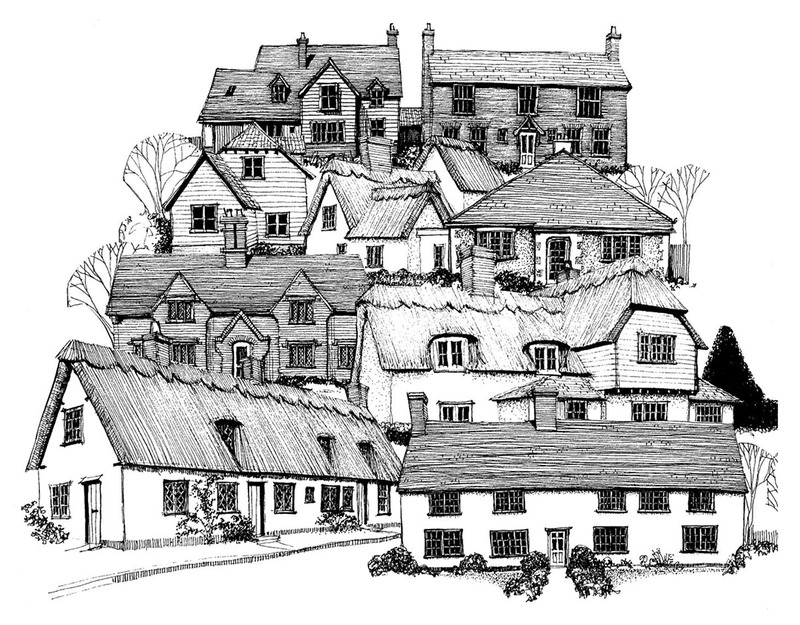 David Grech kindly permitted the cover of the Design Statement to bear one of his wonderful drawings of village houses. Here it is in full.